In Monopoly, whichever player is banker is supposed to keep the bank money separate to the money he’s also doing business with in the market. He’s also supposed to run the bank according to certain rules and if he was cheating it’d be game over. 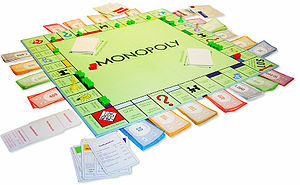 They should bring out a new version of Monopoly in which the Banker is allowed to cheat all he likes and always automatically wins, and another player is called The Government and that player chooses from the Chance and Community Chest cards for the other players instead of just getting them to take the next one in a shuffled pack. The Government cannot only do it to the banker – they automatically give the Banker the best card. Banker and Government get to throw three dice instead of two, and they are also allowed to compulsorily purchase other player’s properties, and also send them to Jail for two turns if they complain about the unfairness of the rules. That modern update to the famous board game would be most enlightening. Nobody would play it given the choice, but in reality of course we don’t really have a choice. After all, there’s a monopoly of government in any country and there’s an oligopoly of banks.